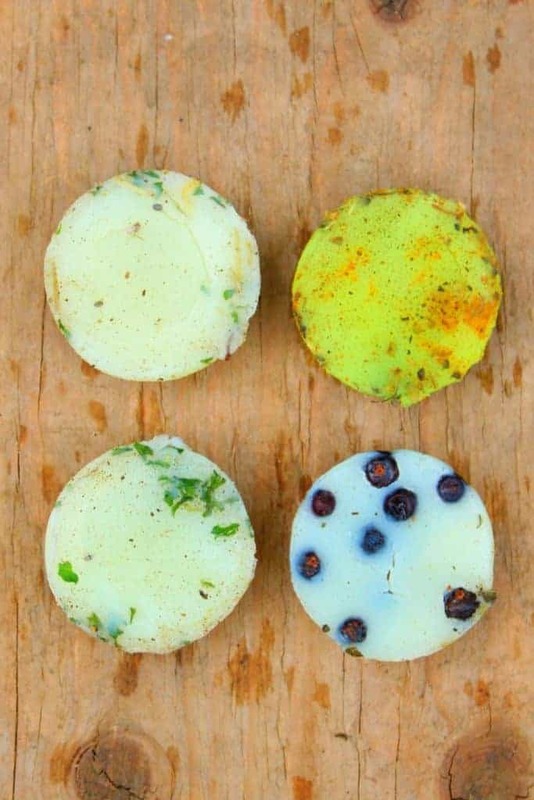 You are here: Home / Our Animals / Chickens / Beat Summer Heat with Frozen Beef Tallow Treats! 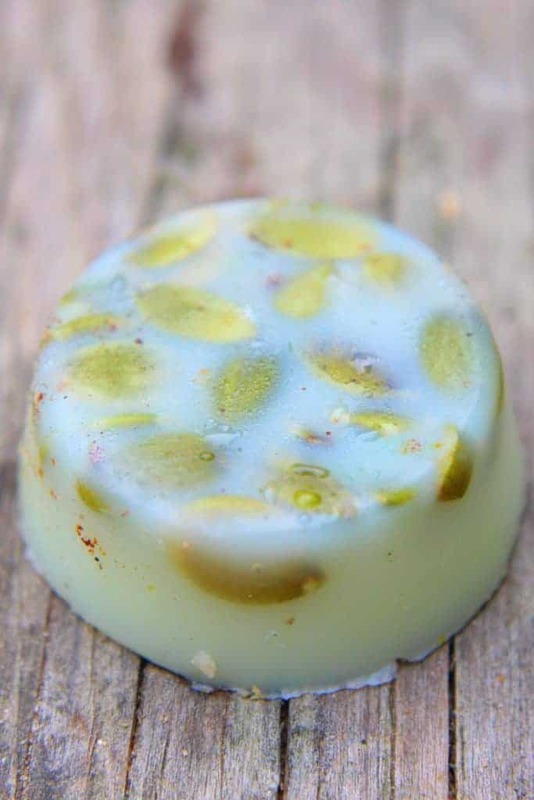 Beat Summer Heat with Frozen Beef Tallow Treats! Well, it’s hot, which means you’re probably a bit worried about your backyard chickens experiencing heat stress. 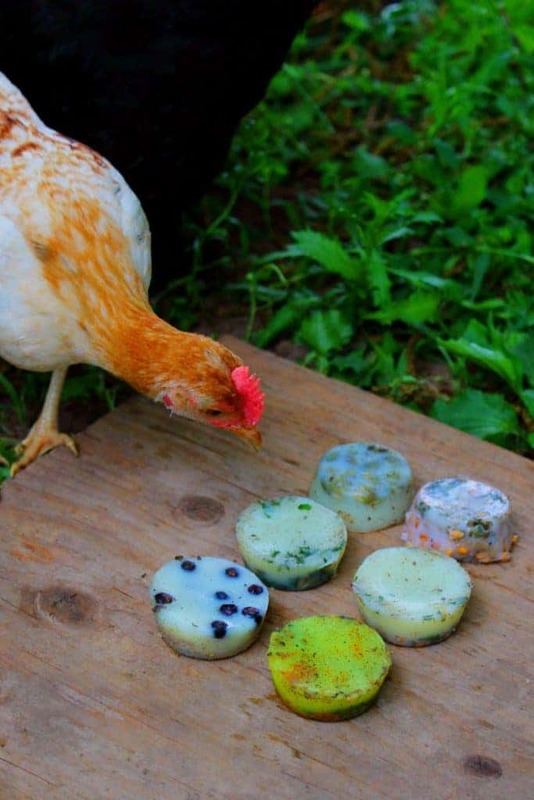 Keeping your chickens cool in summer is easy with frozen treats! Choose the right oil for summer temps! Seeds, herbs, berries, oh my! Heat stress is no joke – each year, many chickens lose their lives because they couldn’t cool down and rehydrate themselves. Since chickens have an internal body temperature of about 106 degrees, and they don’t sweat, they experience high temperatures different from humans, and are much more susceptible to dying from overheating. Frozen suet cakes are easy to make, but very effective to help your hens stay cool when the mercury rises. 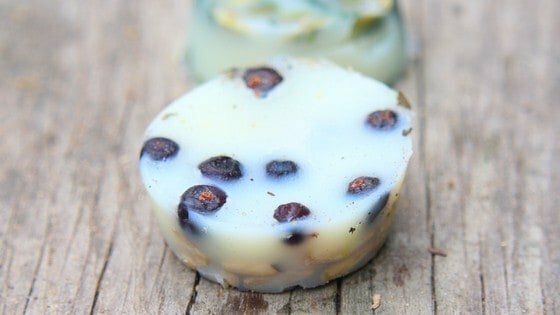 Making frozen suet cakes is easy: simply melt your oil of choice (more about this below), add other ingredients such as corn, herbs, fruit, greens, seeds, etc, and pour into a muffin tin. Then, freeze until solid. You can also combine any of the above oils together. For frozen treats to help ward off heat stress, beef tallow or lard are a better choice than coconut oil. Although coconut oil is very healthy, it melts at 77 degrees F, which is inconvenient for warm summer days. It’ll melt too fast for hens to get the benefit of the cool treat, and you’ll end up with a gooey mess very quickly. Beef tallow has a melting point of about 100 degrees, which buys you a little more time during hot days. I like to also include herbs for their health benefits and nutrients, seeds such as pumpkin or sunflower seeds for fat and nutrients, and orange peel & thyme because studies show that the combination can help reduce the chances of heat stress. For this article, we used juniper berries, oregano, turmeric, orange peel & thyme, chia seeds and rose petals, and pumpkin seeds to make a variety of options for the flock to enjoy. Another good option is WormBGone or chili powder for worm & internal parasite control and/or calendula for healthy egg yolks, dried insects such as black soldier fly larvae for protein, or even oyster shells for extra calcium. Naturally, you can use any ingredients you like, as long as chickens can eat them. But consider using colorful berries or herbs – chickens respond well to color and will naturally want to “taste test” anything in their environment. The more colorful and attractive your treats are, the greater likelihood your flock will try to eat them. So, you gotta put that beef tallow in something, right? Well, all molds aren’t created equal, my friend. Yes, you can use a regular sized muffin tin, but I’ve had good experiences with mini muffin tins. The regular sized tins create a big hunk of beef tallow, which seems to overwhelm chickens. The smaller sized suet cakes are chicken-sized and you can usually make more than 6 treats – and more treats means everyone gets a chance at a taste. Once your treats are frozen and ready to be eaten, simply pop them out of the mini muffin tin, arrange on a plate, and let your hens dig in! Place mini muffin tin in your freezer until the beef tallow is frozen solid. Once frozen, remove the treats from the muffin tin and serve to your flock, making sure each chicken can have a chance at a bite. Hi….I just love your site and all the information you share with us chickeneers. You are absolutely right about the heat. Here is So. Arizona it’s really been heating up. My flocks rather enjoy standing in a dish of water to cool off. I also put frozen bottles of water in their dishes. It doesn’t last long but long enough to cool them off. Keep sending that information and I’ll keep reading. Ft hank you from One Crazy Chicken Farm in So. Arizona. What is your source for beef tallow? Would I go to a butcher shop and ask for th fat trimmings? Hi Linda, you can try the butcher shop, but then you’ll have to render the tallow yourself as well. I updated the article with a link to where you can buy beef tallow on Amazon. Hope this helps!